Several months ago, a few of us at Foursquare started working on a new way to discover the best places around you, a project we now call Marsbot. Our goal: create a product that tells you where to eat or drink before you think to ask for it. It would deliver contextually-aware, proactive recommendations for awesome food and nightlife spots via the simplest communications channel possible: text. Today, I am excited to unveil Marsbot! 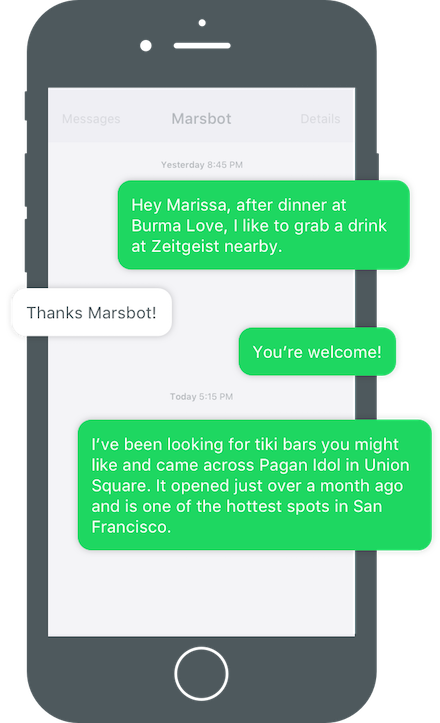 This year in tech has been all about chatbots, but Marsbot is not a chatbot. We chose to experiment with offering proactive and personalized recommendations. It’s a completely different mode of interaction. With a chatbot, you ask specific questions and give specific prompts for what you need. Our goal with Marsbot is to give you the answers before you even ask — just based on where you are and where you usually go. It’s a really big, futuristic challenge. And it’s one that only Foursquare, with our vast location intelligence, can tackle. Personally, I’m lucky to have a best friend who works in the NYC food scene and keeps me hip to the best new restaurants and bars. But not everyone is #soblessed. We think of Marsbot as that best friend who knows what you love, where you hang out — and also happens to know all the best places in your city. Like my bestie, Marsbot learns that I’m into pistachio gelato and I spend most of my time in The Mission. Like my bestie, Marsbot texts me when it discovers a new chai spot opening around the corner from my office. And like my bestie, Marsbot isn’t perfect, but is always full of good intentions. If you happen to use an iPhone and live in NYC or SF, we’d love for you to give Marsbot a try and tell us what you think! Marsbot is a work-in-progress and we are still creating and imagining what the experience should be like. While we are iterating, fixing bugs and improving the experience, we’ll be slowly letting people in from the waitlist. It’ll take time for Marsbot to learn about you and for us to refine how it all works. So please be patient. No one said inventing the future would be easy.